With public input, the mission team has nicknamed the spacecraft’s next target – on the fringes of our solar system – Ultima Thule. This image shows New Horizons’ current position along its full planned trajectory toward MU69, now nicknamed Ultima Thule. The green segment of the line shows where the spacecraft has traveled since launch; the red indicates the spacecraft’s future path. Image via Johns Hopkins University Applied Physics Laboratory. 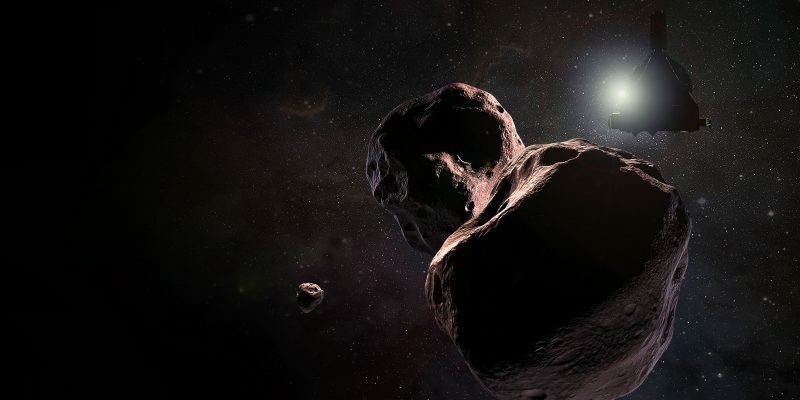 Artist’s conception of NASA’s New Horizons spacecraft encountering 2014 MU69 – now nicknamed Ultima Thule – on January 1, 2019. This object orbits a billion miles (1.6 billion km) beyond Pluto. Evidence gathered from Earth suggests it might be a binary (double) or multiple object. Image via NASA/ Johns Hopkins University Applied Physics Laboratory/ SwRI/ Steve Gribben. NASA and the New Horizons team launched the nickname campaign in early November. Hosted by the SETI Institute of Mountain View, California, and led by Mark Showalter, an institute fellow and member of the New Horizons science team, the online contest sought nominations from the public and stipulated that a nickname would be chosen from among the top vote-getters. The campaign wrapped up on December 6, after a five-day extension to accommodate more voting. Of the 34,000 names suggested, 37 reached the ballot for voting and were evaluated for popularity. This included eight names suggested by the New Horizons team and 29 nominated by the public. The team then narrowed its selection to the 29 publicly nominated names and gave preference to names near the top of the polls. Names suggested included Abeona, Pharos, Pangu, Rubicon, Olympus, Pinnacle and Tiramisu. Final tallies in the naming contest posted here. After the flyby, NASA and the New Horizons team say they’ll choose a formal name to submit to the International Astronomical Union, based in part on whether MU69 is found to be a single body, a binary pair, or perhaps a system of multiple objects. Learn more about New Horizons, NASA’s mission to Pluto and the Kuiper Belt, at http://www.nasa.gov/newhorizons and http://pluto.jhuapl.edu. 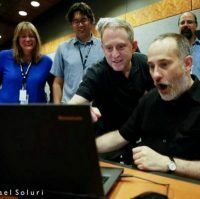 New Horizons mission team members during the 2015 Pluto encounter. Expect more excitement to come when New Horizons encounters Ultima Thule on January 1, 2019! Bottom line: With public input, the New Horizons mission team has given the nickname Ultima Thule to the spacecraft’s next target, Kuiper Belt Object 2014 MU69. Founded on March 10, 1942—just three months after the United States entered World War II—APL was created as part of a federal government effort to mobilize scientific resources to address wartime challenges. APL was assigned the task of finding a more effective way for ships to defend themselves against enemy air attacks. The Laboratory designed, built, and tested a radar proximity fuze (known as the VT fuze) that significantly increased the effectiveness of anti-aircraft shells in the Pacific—and, later, ground artillery during the invasion of Europe. The product of the Laboratory’s intense development effort was later judged to be, along with the atomic bomb and radar, one of the three most valuable technology developments of the war. On the basis of that successful collaboration, the government, The Johns Hopkins University, and APL made a commitment to continue their strategic relationship. The Laboratory rapidly became a major contributor to advances in guided missiles and submarine technologies. Today, more than seven decades later, the Laboratory’s numerous and diverse achievements continue to strengthen our nation. APL continues to relentlessly pursue the mission it has followed since its first day: to make critical contributions to critical challenges for our nation.